On January 17th, 1953 Chevrolet first showed the world the all-new model known as Corvette in a display at the famed Waldorf Astoria Hotel. Tomorrow, Chevy brings the all-new, seventh generation, 2014 Corvette Stingray back to New York. New Yorkers flocked to see the new model in 1953 and not much has changed. This week Chevrolet revealed to the public the 2014 Corvette Stingray at the North American International Auto Show in Detroit. During the exhibition, the area surrounding the new Stingray was always packed with on-lookers and media who could not get enough of the new supercar. We all know that things have changed and many people use the internet to find information on their favorite vehicles. Our editor reported the highest customer interest in history on Torque News for Corvette information and it was the highest searched key word of the week – by far. For the best report on the Corvette available, please see this link. This kind of enthusiasm for a model has an impact on manufacturer’s plans. In fact, the huge surge of interest in the Corvette in 1953 after its reveal led to an accelerated production schedule. Although only 300 could be produced in 1953, the special line in Flint (not yet Kentucky) was ramped up as fast as it could be to produce more. All of the 1953 models were white with red interiors. Early corvettes were not inexpensive either. At $3498, a customer could have a comfortable home in many parts of the US at that time for that price. At the Detroit Auto Show Chevrolet had a Corvette from every generation on display. This car’s heritage rivals any in the world. The Corvette is the longest running sports car model in the world today. 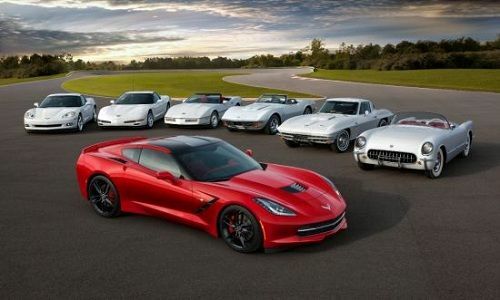 Looking back, it is easy to see that every generation of the Corvette broke new ground with regards to technology. In 1957 Corvette had a fuel injected engine. That technology was not unique to Corvette, but most cars still used carburetors until the early 1980s. One decade after launch the 1963 split rear window design again drove customers to dealer lots due to its good looks as well as world class performance. Other Corvette milestones in technology included the non-metallic body. Although we take this for granted now, it was a controversial move, but one that came to define the car. In 1963 the Corvette had an independent rear suspension. That is one bit of refinement drivers of current Mustang GTs won’t enjoy. Another trait that always set the Corvette apart was that it could stop as well as go. Most muscle cars of the era had drum brakes well in to the 1970s, but Corvette had disc brakes at all four corners in 1965. When buyers drive the all-new 2014 Corvette Stingray they will be in a vehicle with a sub 4 second 0-60 time that is slated to achieve 26 mpg highway mileage. Chevrolet will do this with a massive 6.2 liter pushrod V8 engine, rather than turn to an underpowered small turbo engine that would do well in EPA testing, but poorly on actual drives. Look for the all-new 2014 Corvette Stingray on display around the Big Apple tomorrow and for it to begin to appear for sale in dealerships late summer.